More than 400 delegates from 20 countries met this week in the Indian Himalayas to implement changes that will have a profound effect on the worldwide Tibetan diaspora. If ratified by the parliament-in-exile, the withdrawal of five clauses in the Tibetan constitution will abolish the Council of Regency that has been in place for 370 years. Recently, the Dalai Lama announced that he was giving up his political position and would in future concentrate on his spiritual and humanitarian responsibilities. This decision prompted the meeting in India – which aims to complete the transition from theocratic rule to democracy. With the Dalai Lama no longer a temporal leader, the need for a regency is eliminated. 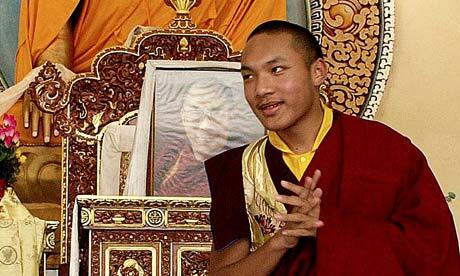 It also means that the 26-year-old 17th Karmapa, Urgyen Trinley Dorje, will not now be become a regent – despite the fact that he has been groomed for this role since his dramatic escape from Tibet in 2000. Urgyen Trinley was confirmed as the 17th Karmapa by both the Chinese authorities and the Dalai Lama. On his arrival in India he went straight to the Dalai Lama's headquarters and has been living close by ever since. In 2008 the Dalai Lama was filmed telling the Karmapa and Ling Rinpoche, another young senior lama, that they would inherit his responsibilities when he died. "You will be the ones to continue my work," he said. It now seems that this work will be confined to spiritual matters connected with the stewardship of Tibetan Buddhism, which has attracted tens of thousands of converts around the world during the past 30 years. According to Arnaud Dotezac – a visiting professor at Geneva University – the abolition of the regency takes the sting out of a controversial issue. The Karmapa is the head of the Kagyupas – a sect of Tibetan Buddhism that was in power until violently suppressed in the 17th century and replaced by the Gelugpa Dalai Lamas. "It was a bloodbath," Dotezac says. "Thousands of people were killed, Kagyu monasteries were forced to convert into Gelugpas and the idea of Kagyus being friends with Gelugs was unthinkable." Dotezac also believes that a financial scandal that erupted in the Karmapa's monastery in January tarnished his reputation to a degree that he was no longer seen as acceptable as a regent. "Everything changed after that," he says. "The process of decoupling religion from politics accelerated. I think by renouncing his political role the Dalai Lama is preparing the ground for his return to Tibet. He has stated his wish to go back and to die there." In pre-Chinese Tibet, regents took control after the death of a Dalai Lama and ostensibly for an interim period during the childhood of his reincarnation. In reality, regents were immensely powerful at all times and several young Dalai Lamas died in suspicious circumstances. The present (14th) Dalai Lama may have escaped the possibility of this fate because he was forced into exile in 1959. Establishing Urgyen Trinley Dorje as a purely spiritual leader sidelines the political ramifications of more than one controversial issue that has emerged since he was recognised as the 17th Karmapa in 1992. Two years later Trinley Thaye Dorje escaped from Tibet with his family and was formally enthroned as the 17th Karmapa, after being recognised by the senior Kagyu lama Shamar Rinpoche. This means that there are two Karmapas. Some senior lamas accept this status quo, other factions insist that their Karmapa is the only genuine one. There are also persistent claims that Urgyen Trinley is a Chinese plant and that his escape could not have happened without agreement from the Chinese authorities in Tibet. "This is a conspiracy theory" says Robbie Barnett, director of modern tibetan studies at Columbia University. "There is no credible explanation for the suggestion that it was in China's interests for the Karmapa to escape. Everything points in the opposite direction – it was a huge diplomatic blow and a big humiliation for the Chinese to see their Karmapa flee to India." Robbie Barnett points out that Urgyen Trinley could have escaped without help from Chinese officials. "At that time," he says, "thousands of Tibetans were escaping to Nepal every year without being caught. In addition, Urgyen Trinley had resources and a support team to help him. They took a remote route not often used by refugees escaping on foot and his driver knew where he should get out of the car and walk to avoid check points." To most of us born and brought up in western democracies Tibetan politics seem like a hangover from the Dark Ages. But now the Dalai Lama is launching his people into the 21st century, moving towards a future Dalai Lama being approved by an elected government, headed by an elected prime minister. He has neutralised controversies and in giving up his political status he has demonstrated a high level of political skill.